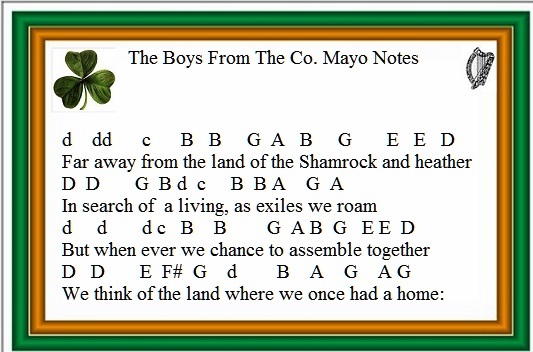 The Boys From The County Mayo Lyrics Guitar Chords-Irish folk song- To play along with the youtube video of Colm O'Donnell place capo on 2nd fret which means you will be playing in the key of E. I have included the music notes in basic letter note format. The capital letters are the lower notes as far as the B and the lower case letters are the high ones. If your playing it on the tin whistle then ignore that F# because the F is already sharp on the whistle.